Washington sophomore Hannah Haithcock, left, puts up a shot over two defenders from Clinton-Massie during an SCOL game at Washington High School Wednesdsay, Feb. 1, 2017. Haithcock had a double-double (19 points and 13 rebounds) in the Lady Lion’s 45-33 victory. 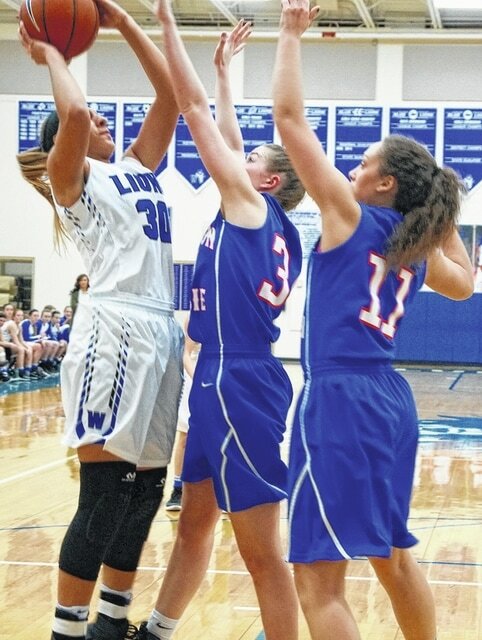 The Washington Lady Blue Lions won their season-high fifth game in a row at home Wednesday, 45-33 over Clinton-Massie. A nearly 11 minute scoring drought to start the game spelled doom for Clinton-Massie. Washington improves to 10-9 overall, 6-7 in the league. The loss puts the Lady Falcons at 5-13 overall and 1-11 in the SCOL. It wasn’t a pretty game as the two teams combined for 57 turnovers — 31 by Massie and 26 by Washington. The Lady Falcons shot 23 percent from the field while the Lady Blue Lions were slightly better at 27 percent. Faith Cottrell led Clinton-Massie with 12 points, 10 of those in the third quarter. “Faith shot the ball we for us,” said CM coach Tim McGraw. Hannah Haithcock led Washington with 19 points. She hit on 7 of 10 from the free throw line. “I saw a lot of great things on the defensive end tonight,” Washington head coach Samantha Leach said. “The girls did a great job on the boards and made a huge improvement (boxing out) from last week when we played Massie. “Offensively, we are continuing to work on eliminating silly turnovers,” Leach said. “Massie was really scrappy tonight and caused us to turn the ball over more (than we) anticipated. Despite its offensive struggles, Clinton-Massie trailed by just 11 at halftime, 16-5. McGraw noted the performances of veteran Brook Rose, who had eight points for the Lady Falcons; and Hannah Doss, who played well in her first full varsity game of the season. Statistically for Washington, the Lady Lions had 32 rebounds. Hannah Haithcock had 13 for a double-double. She also blocked five shots. Shawna Conger had five rebounds and led the team with five assists. She also had three steals. Washington had 10 steals as a team. Rayana Burns had three steals. Senior Savannah Wallace scored nine points and blocked one shot.